Souza is a legislator and former host of a police TV show, "Canal Livre"
(CNN) -- A former Brazilian state legislator and TV host who authorities allege also was a drug dealer who ordered rivals killed has surrendered to police after being missing for four days, the government said Friday. Wallace Souza was expelled from the state congress last week, stripping him of his legislative immunity. Wallace Souza had been considered a fugitive since officials went to arrest him Monday and found him missing, police said this week. He was expelled from the state congress last week, stripping him of his legislative immunity from prosecution and opening the way for authorities to charge him with several crimes, the Legislative Assembly in the northwestern state of Amazonas said on its Web site. Souza turned himself in Friday in his home city of Manaus in Amazonas, the government-run Agencia Brasil news outlet said. Authorities accuse him of drug trafficking, witness tampering, possession of illegal firearms and forming gangs. Souza has denied the accusations. Earlier this year his lawyer criticized key testimony and questioned the investigation. "In all the investigations carried out by the public minister and the police, up to now they have not presented any technical evidence of any type," attorney Francisco Balieiro said on Brazilian TV in August. Authorities said this summer that Souza, the former host of a police TV show called "Canal Livre," ordered that criminal rivals be killed and then would have his TV camera crews arrive first on the scene. The killings not only got rid of drug-trafficking competition, but also drove up ratings, officials said. "In truth, they went as far as creating acts," said Thomas Augusto Vasconcelos, intelligence secretary for Amazonas state. "It's been determined that the crimes were committed in order to generate news for the program." State Attorney General Otavio Gomes told the Agencia Folha news outlet that Souza's gang was linked to six slayings. But prosecutor Pedro Bezerra told the news outlet he could not bring murder charges against Souza for lack of concrete evidence. The Amazonas State Justice Tribunal, which held a hearing on the accusations, said the criminal complaint was based on testimony by former Souza associate Moacir Jorge da Costa. After Jorge's arrest, officials said, he revealed details of the gang's reputed activities, including slayings. Souza's lawyer, Balieiro, said this summer that police and public ministry officials did not have standing to investigate the TV show host because he was a legislator. That point now appears moot with Souza's expulsion from the state assembly. 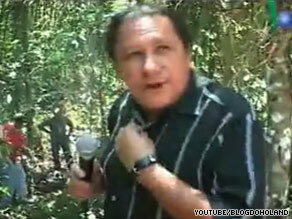 Furthermore, Balieiro said, Jorge's testimony was obtained in an irregular manner. According to the state public minister who brought the charges against Souza, the legislator's son, Raphael, belonged to the criminal gang. Raphael Souza has been convicted of homicide, drug trafficking and illegal gun possession, according to authorities. Fifteen people connected with Souza, among them police officers and a chief, have been arrested. Souza, a former police officer who left the force more than 20 years ago after being implicated in a fuel theft case, received the most votes of any candidate in the last election in Amazonas state. His TV show went off the air last year after the investigation into his possible criminal involvement intensified. He lived in the jungle city of Manaus, the capital of Amazonas state, a region known for its prevalent lawlessness. Souza would often rail on his lunchtime show about the killings and other atrocities being committed in the area.